Originally published on 24 February 2017. Giniu Gin from the Sardinian brand Silvio Carta, is ginitaly’s next Italian Gin to review, a real noticeable product that introduces itself with a stunning packaging and a solid background idea. Juniper is Sardinia is easy to find, in its sub-species “Juniperus phoenicea” or in Italian “ginepro coccolone”, because of its big greenish “cones”, that have a different aromaticity from the juniper we’re all used to smell and love. Giuniu’s Juniper smells fresher and “greener”, and it’s really inviting, a smell that everyone who has wandered in a Sardinian beach can remember. Traditionally, these “cones” were illegally distilled to produce something like a gin, called “giniu” locally, a spirit that was forgotten in recent times and that this brand wants to relive. The link with the territory is evident then, and it offers the chance to use some of the most interesting botanicals I ever smelled in a gin: myrtle, pistacia lentiscus or mastic, thyme, wild fennel, lemon and Salvia desoleana and juniper of course. They all come from Sardinia and you can tell it. The bottle is rich in details, heavy and luxurious, graphically it enhances the birth place of this gin, and it sure helps to create some desire to taste it. The 40%abv isn’t strong, but it’s the right choice to work with these delicate botanicals, the subtles herbaceous notes are very well tuned in Giniu. You can clearly smell the juniper and the myrtle, then comes fennel’s freshness, the citric note and the Sardinian sage. Good smell, precise, neat and strong but not pungent. The Martini Cocktail is easy to drink with Giniu, so rich in herbaceous flavours, where the gin’s botanicals lead the scene. 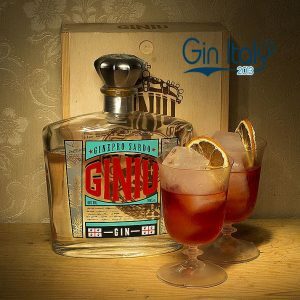 The Negroni is full bodied, a right symphony of dozens of herbs, where all the ingredients mix together well, and Giniu doesn’t top the vermouth and the Campari. 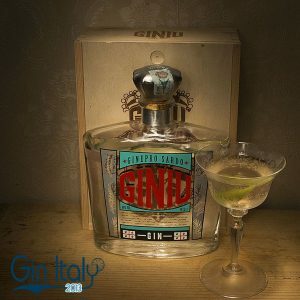 The Gin and Tonic is fresh, precious, dry and rich, a herbaceous feast in your mouth, where you can really feel the territory Giniu comes from. 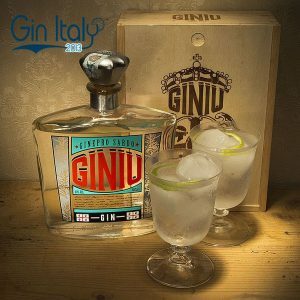 Giniu Gin is surely on of the best Italian Gin you can find on the market, the general quality is better then the other gins, let’s admit it clearly, because you will never be able to reproduce this gin elsewhere.